When we look at Shots On Goal Against rates (SA60) and GA60 from 2008-09 through the 2014-15 season, the variance due to the talent of the goalie becomes clearer. Teams with a higher SA60 tended to have a higher GA60 to the tune of a 20.21% correlation. This is still a fairly strong correlation from a statistical standpoint, but it really underlines the differences between teams in terms of the performance they get from their goaltending. 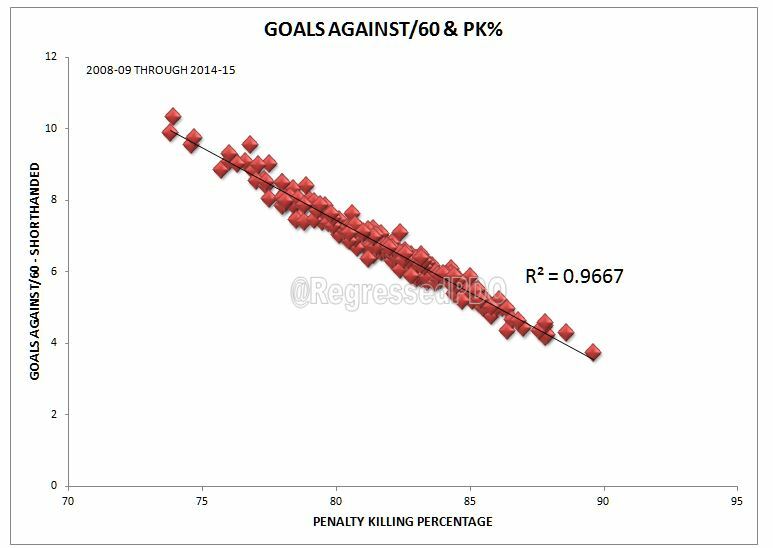 Knowing that PK% and GA60 have a very strong correlation and SA60 and GA60 also correlate fairly well, when we look at SA60 relative to PK%, we see a correlation very similar to that of SA60 and GA60: 20.21% and 20.13%. If we omit the shortened 2012-13 season and the current season that has not yet concluded in order to remove the smaller sample sizes, the correlation between SA60 and PK% increases to 24.68%. 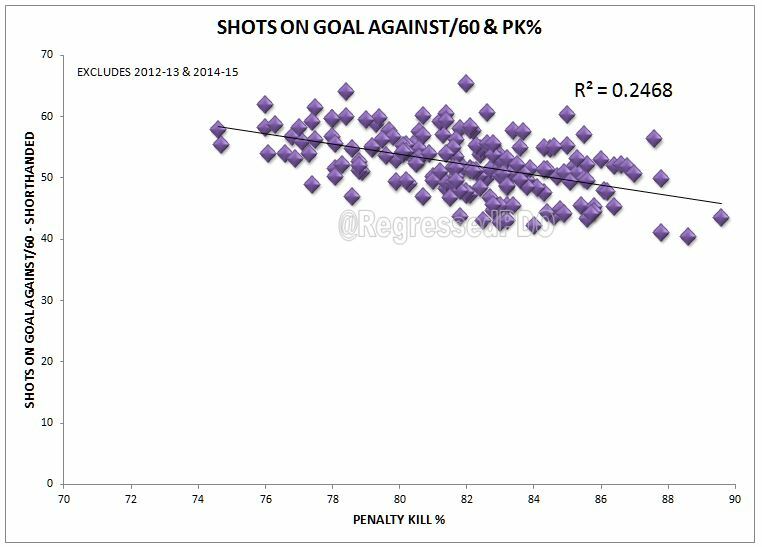 Due to the correlations in the data and also simple logic, it would be accurate to say that limiting the frequency of Shots On Goal during the penalty kill aids in actually killing the penalty. This isn’t a big leap for anyone at all familiar with hockey, but it is interesting to see how the data works together. 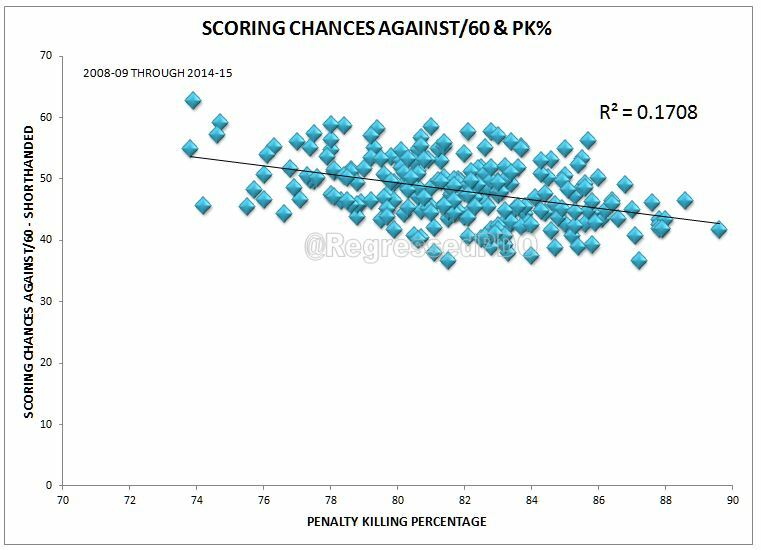 I admit, when I undertook this project, I expected SA60 to have a bigger impact on PK% than is evident from the last 7 seasons of data. 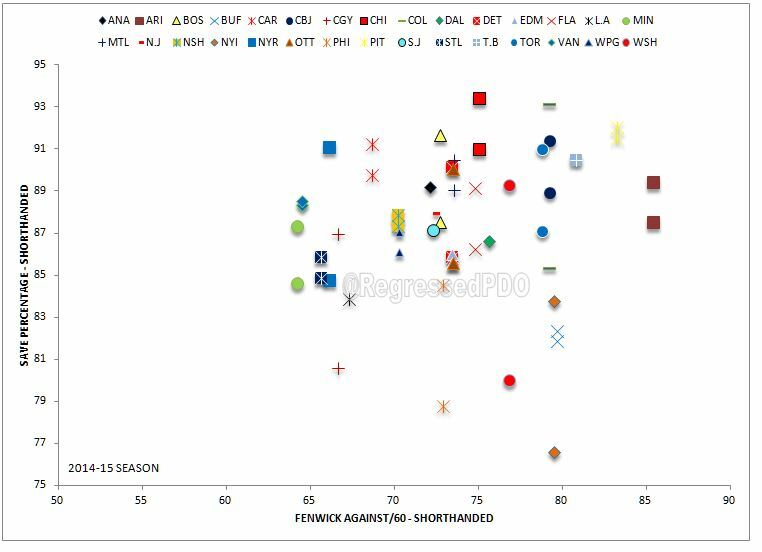 This got me curious to see how other metrics such as Fenwick and Scoring Chances would compare. 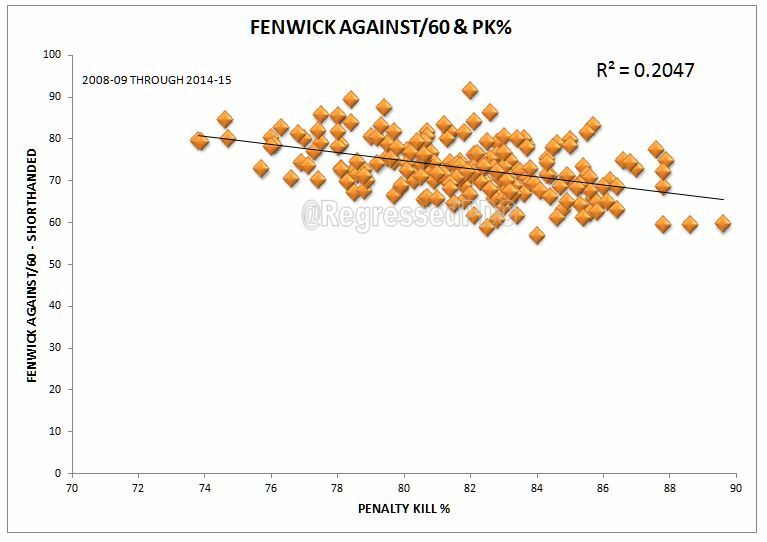 Fenwick Against rates had nearly an identical correlation to PK% that SA60 had to PK%. FA60 and PK% showed a 20.47% correlation while SA60 and PK% showed a 20.13% correlation. If we remove the shortened seasons of data, the correlation increases to 24.31%. 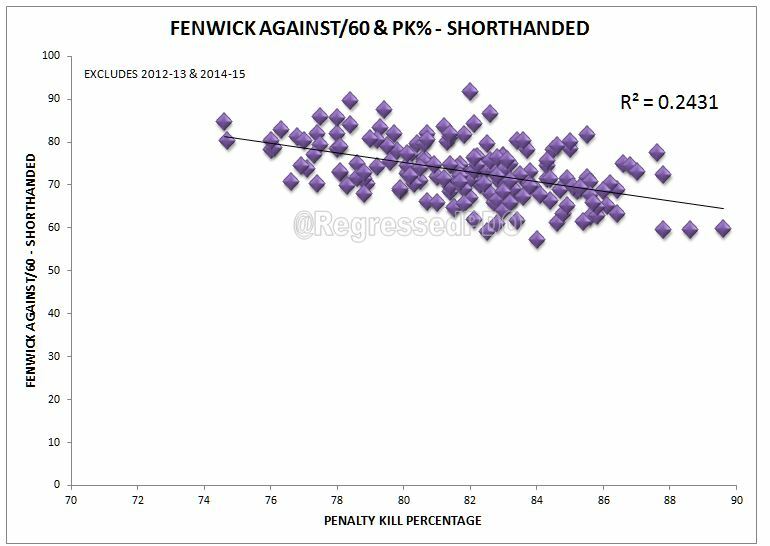 Given the remarkable similarity between Shots On Goal and Fenwick in relation to PK%, I would feel comfortable using Fenwick in lieu of Shots on Goal since, overall, Fenwick gives a better indication of offensive pressure. Scoring Chances are often used to look at offensive pressure particularly when a shot quality argument arises. 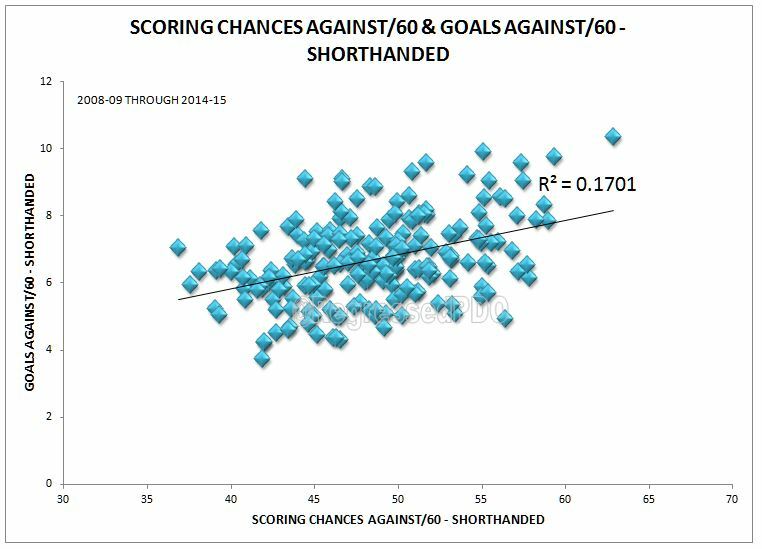 Using Scoring Chances (defined in link) data from war-on-ice.com, I compared Scoring Chances Against rates (SCA60) and GA60 while a team was shorthanded from 2008-09 through 2014-15. 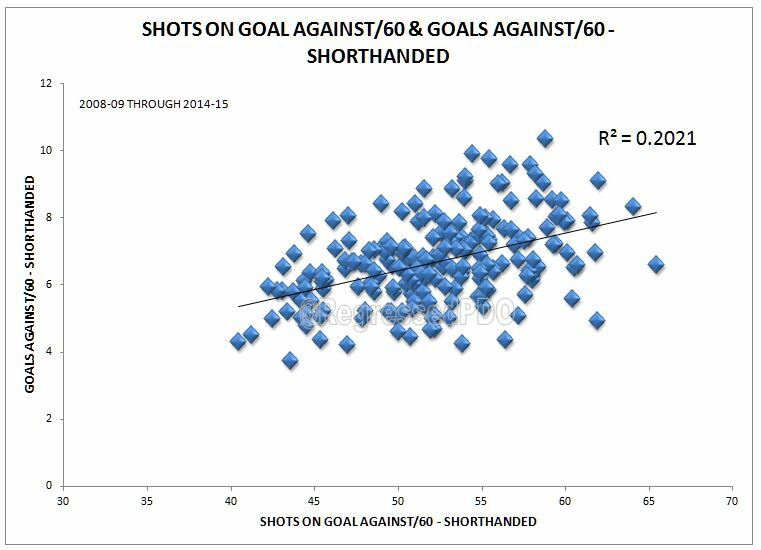 The correlation of 17.01% is a bit lower than the Fenwick and Shots On Goal measures as we saw above. 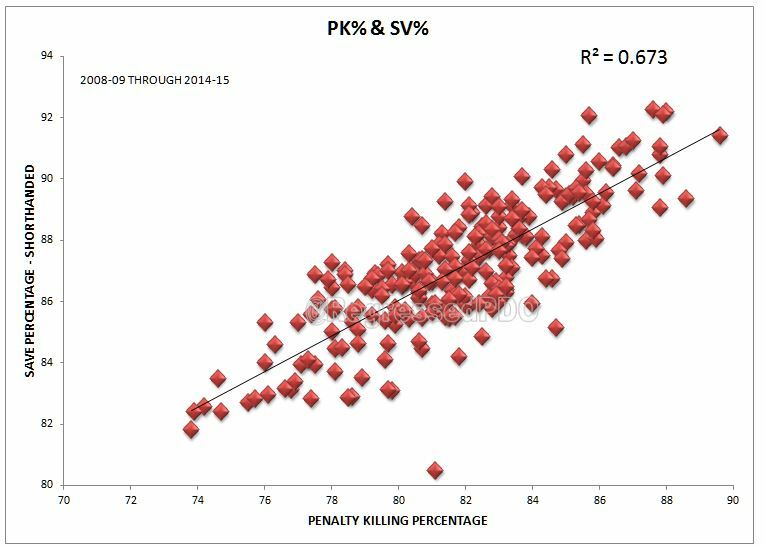 When SCA60 is compared to PK%, we see much of the same, i.e. a correlation of approximately 17%. 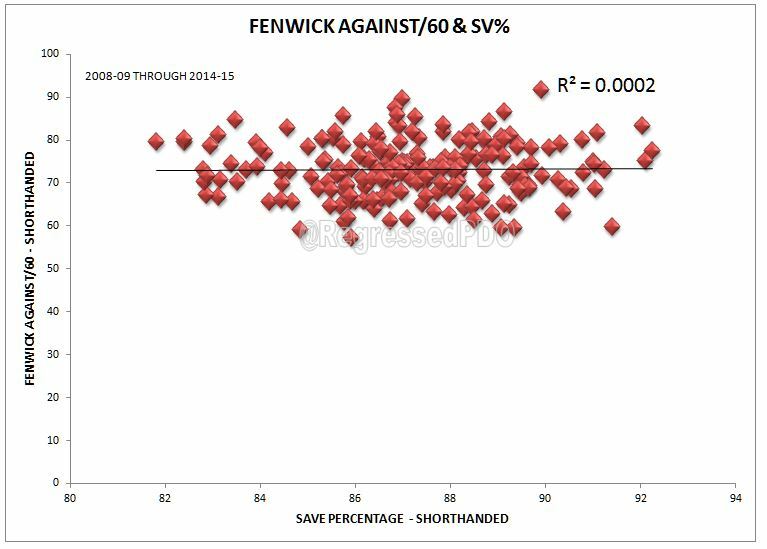 Given the lower correlation, Fenwick is probably the preferable measure to use here. 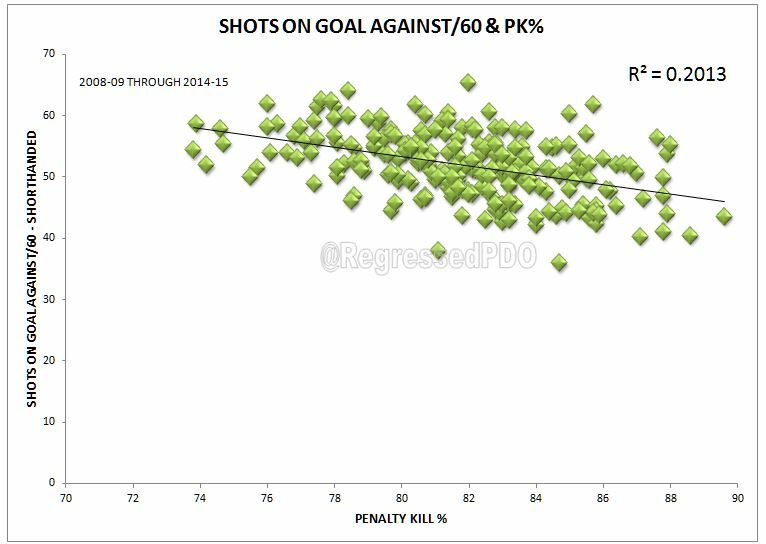 Using just the raw numbers from 2008-09 through 2014-15 as seen in the graph above, Fenwick shows the highest correlation to goals against on the penalty kill. 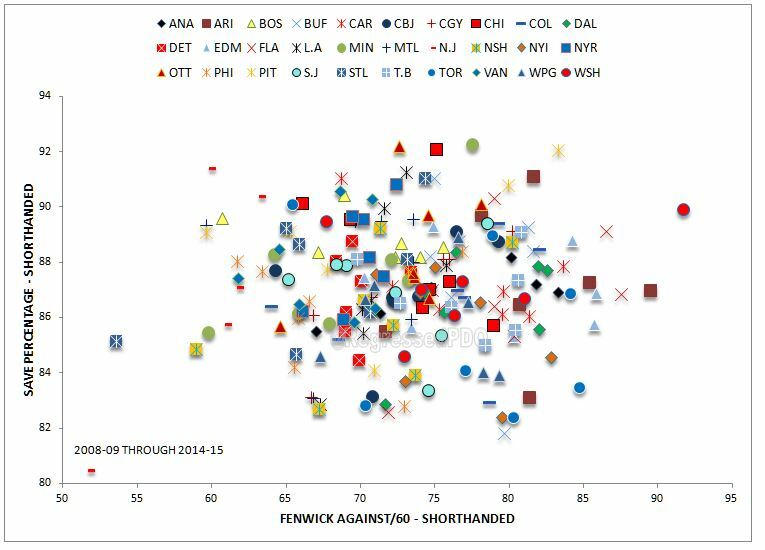 This is likely due to Fenwick being a better indicator of offensive pressure over large samples than Shots On Goal and Corsi. This still doesn’t answer the question of what the best tool, outside of a great forecheck which stops Shots On Goal and Fenwick events from happening in the first place, is for killing penalties. The forechecking, zone coverage and zone clears are reflected in the Fenwick data of course, but we still need to look at what the goalies bring to the table. 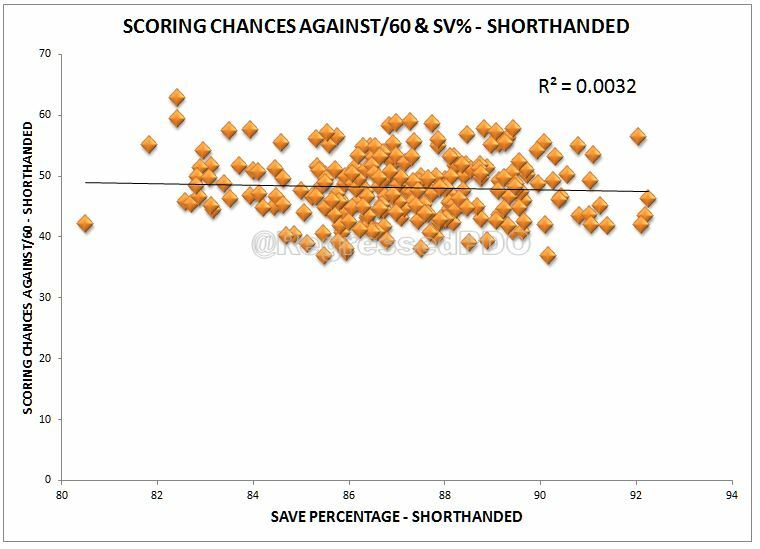 How do Shots On Goal, Fenwick and Scoring Chance rates correlate to Save Percentage on the penalty kill? 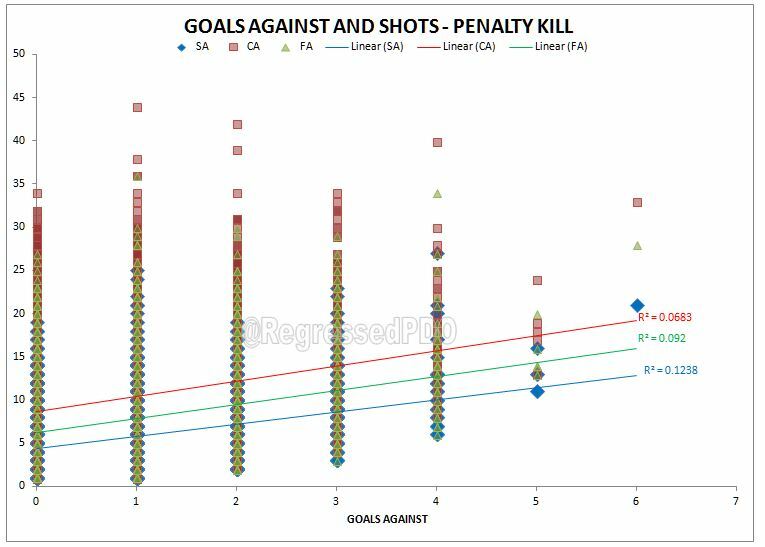 Using SA60, FA60 and SCA60 to find a correlation to Sv% league wide on the penalty kill is not really useful as you can see from the graphs above. 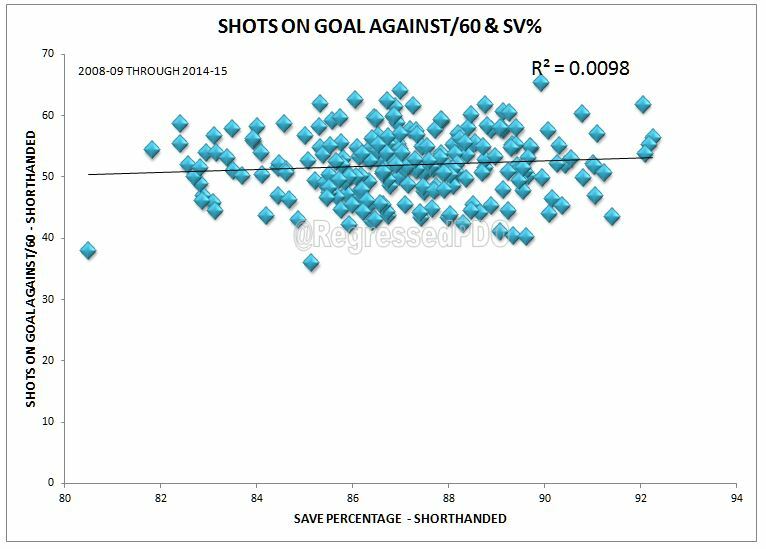 PK% is based upon goals allowed as is Sv%. 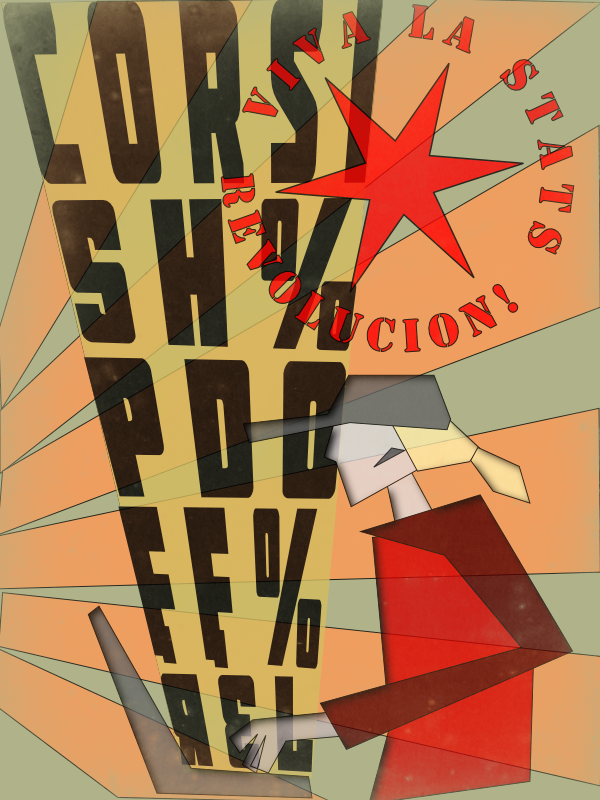 The correlation between the two, 67.3%, is very strong as a result. 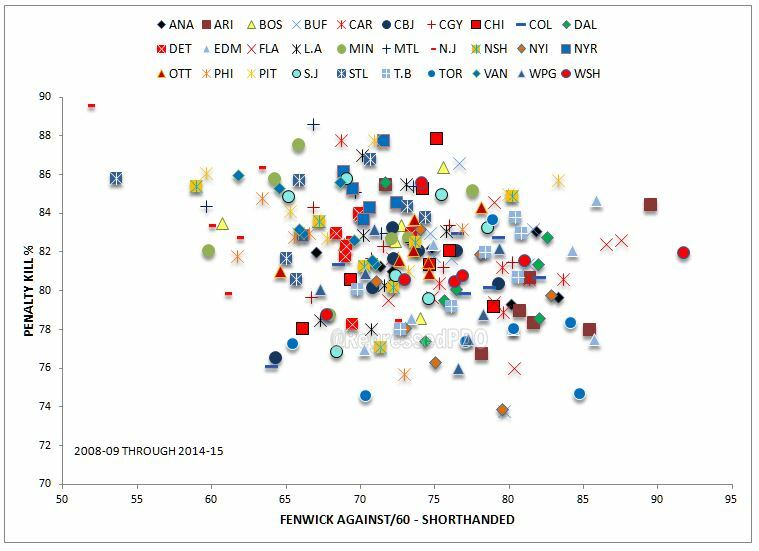 Below is a graph of each team’s Sv% and PK% from 2008-09 through 2014-15. Team by team PK% in relation to FA60 again shows that the team effects are important as you can see how the teams tend to cluster from year to year, but Sv% remains the bigger indicator. Several trends on these graphs are very interesting. Tampa Bay’s FA60 remained tightly clustered from season to season, but their PK% still changed quite a bit during the same seasons. When we look at the graph below, we see that the Sv% changed quite a bit from season to season regardless of their FA60 and the PK% tracked with the team’s Sv%. Winnipeg’s FA60 has changed quite a bit from season to season with most of their season PK% marks remaining low. When Winnipeg’s Sv% went up for two of the seasons, the team’s FA60 was very low for one and among it’s highest for another. Preventing the power play team from getting into the attacking zone should be the first focus of the penalty killers. Once the power play is set up, the PK needs to block shots and clear the zone of course. Otherwise, the PK is largely dependent upon the goalie as his performance seems to have a large impact on whether the penalty kill is successful. Below are graphs for the 2014-15 season. Goalies for each team that have at least 50 minutes on ice shorthanded are noted. (Where players have been traded, they are included with the team they played the most games for during the current season.) There are certainly teams that benefit from their lower FA60, but there are others that are successful in spite of their FA60. There are several things that stand out about the current season’s data. Minnesota has a high PK% that seems more reliant, up to this point, upon limiting the shots faced by the goalies as opposed to relying upon a strong performance in goal. 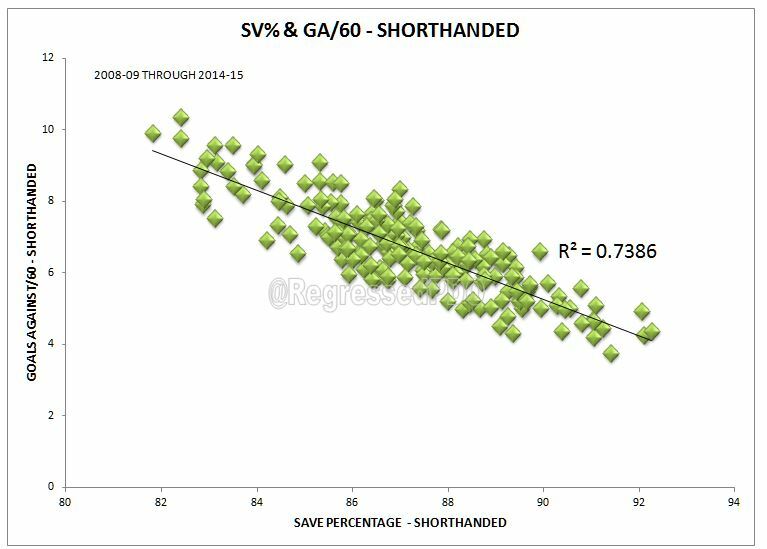 Vancouver is in a similar situation as well, but with better Sv%s from their two goalies. Carolina has done well limiting shots and has good Sv% marks from their goaltenders, which has led to one of the best PK% in the league. Chicago is middle of the pack in terms of limiting shots against but their goalies have two of the highest Sv%s on the penalty kill so they rank 1st in the PK% in the league. St. Louis has a very good FA60 but poor goalie numbers and so they fall into the middle of the pack in terms of PK%. Pittsburgh is giving up shots at the 2nd highest rate in the league behind only Arizona; however, unlike Arizona, Pittsburgh has very good Sv% marks from both of its goaltenders and thus one of the best PK% in the league. 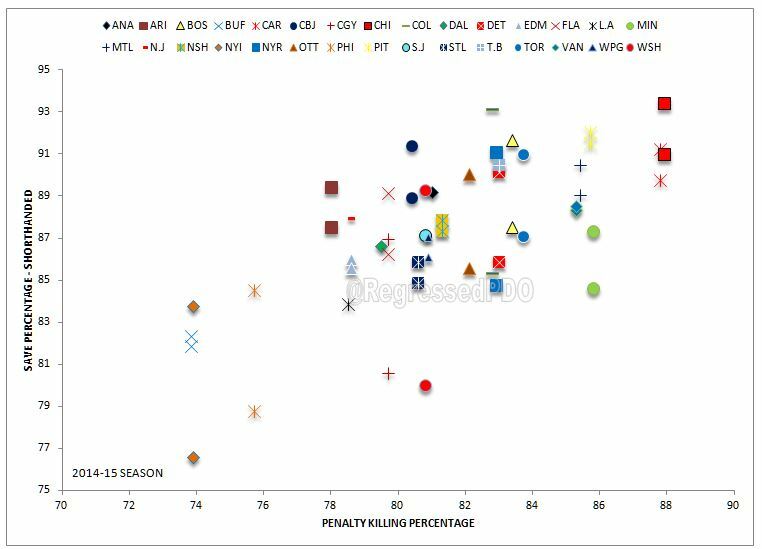 The graphs above give good insight into why some of the metrics we use to evaluate 5 on 5 play do not, on their own, give us an easy description or prediction of why a penalty kill is successful or whether that success is sustainable. 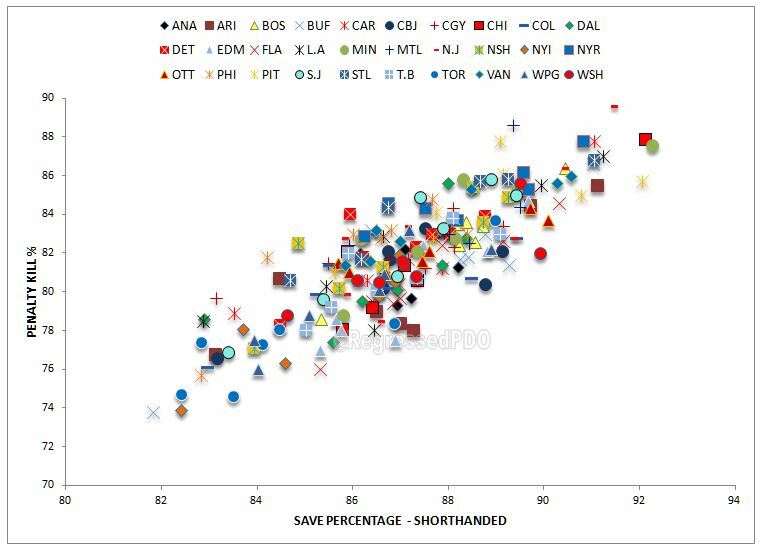 Because the penalty kill is often so dependent upon goaltending, identifying specific ways each team’s play affects their goalie’s Sv% is very important. The systems used by each team, along with their goaltending strength need to be used together to determine how good a penalty kill is and this is best done on a team by team basis to accurately decide what is fueling the team’s success and whether the success is sustainable.